On the way up the south ridge of Mt. 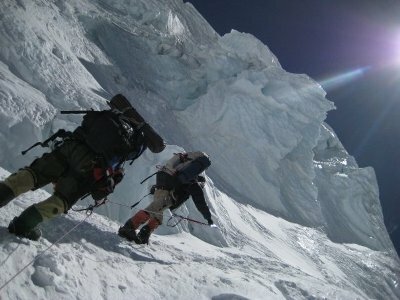 Everest, past the treacherous Khumbu Icefall, is an area where most fatalities on the mountain occur. The area — 8,000 meters above sea level — marks the death zone. “It’s a place where the body literally starts to die for lack of oxygen,” says Elia Saikaly. Along the way are countless crevasses with drops of more than a thousand metres. It’s a perilous journey indeed that Saikaly is undertaking as he attempts to scale Mt. Everest. And thanks to social media tools, more than 10,000 Canadian kids will share his experience real time, almost as if they were making the trek with him. The students, from 130 schools across Canada, will view video clips of the 31-year-old adventurer/film maker’s progress, read his posts on Facebook and updates on Twitter, and engage in real-time conferences with him through a Skype phone connection. “They’ll be up there with me, every step of the way,” Saikaly told ITBusiness.ca. Saikaly had attempted to climb to the summit of Everest before but owing to very bad weather had to turn back after reaching within 500 feet of the peak. The climb was to commemorate his mentor Sean Egan, who died during a descent from the mountain in 2005. Saikaly FindingLife/Everest Expedition 2010 is raising money for ChildHaven, a non-government organization (NGO) building schools for Nepalese children. Through the group WIGUP (While I Grow Up), an interactive Web learning channel, Saikaly has also developed a multi-media program that connects his exploits to children’s school lessons as well as health, fitness, goal setting, geography, social awareness and philanthropy. “The children are totally fired up,” said Neil Orlowsky, head of the geography department at Westmont Collegiate Institute in Thornhill, Ont. Grade nine geography class students and grade 12 world issues and international politics students from Westmont are among those who will be following Saikaly on Twitter and Facebook. On Tuesday, the students hope to get their Skype hookup with Saikaly up so they can communicate with him real-time. Orlowsky, a former climber himself, says connecting classroom lessons with real world experiences enhances the learning process. His geography class will be applying their latitude and longitude lessons as they trace Saikaly’s journey. Another class will be tackling plate tectonics while following the climb. A physical education class is also incorporating a modified version of Saikaly’s training regimen to their workout. “It makes teaching so much easier, because there’s so much interest among the children. They’re the ones asking the questions,” said Orlowsky. Westmont students will also be exploring ways to help Saikaly raise money for ChildHaven. Some of the plans involve collaborating with an indoor rock climbing place to host a climbing event and selling a video compilation of Saikaly’s previous adventures. Shortly before he headed for Katmandu, Saikaly met with the children at Westmont to brief them about the trip. The latter listened intently as he recounted life experiences that fuelled his drive to scale some of the world’s tallest peaks. The adventurer faced a barrage of questions about his hardships and dangers on earlier climbs, equipment he uses, and whether he ever got scared or not. It was “celebrity hour” as girls posed beside him for a quick phone cam shot, and boys in the weight lifting class compared pecks and biceps with him. With Saikaly just days from scaling the Everest, the world’s tallest mountain (measured from sea level to its summit), Westmont students are glued to their computers. “They’re on his Web site daily and check his posts three to four times a day. This is the first time they ever met someone who’s climbing Mt. Everest. They’re so inspired, they’re even talking about it with their parents,” said Orlowsky. Saikaly knows a great deal about the power of inspiration. “During my teen years, I was lost. I fell into drugs and was kicked out of school — every school,” said Saikaly who grew up in Montreal. It was only by chance that a friend introduced him to a local body builder who became his trainer. Working hard, Saikaly eventually became a body building champion. This was followed by a detour into music, and then a stint at male modeling. Aim high indeed. Saikaly followed this advice … literally. The late Egan was on a quest to be the oldest person to scale Everest. He was also raising money to build a school for children in Nepal. He died during a 2005 attempt at the age of 63. Saikaly was part of Egan’s team but didn’t climb the mountain. He only provided movie camera training to the sherpa accompanying the professor. 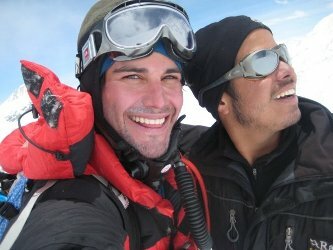 Since his mentor’s death Saikaly, who until then had never slept in a tent let alone scale a mountain, trained earnestly and began scaling some of the world’s highest peaks. He dedicated his efforts to charity and inspiring children. In recent years various organizations have been using social networking technology for charitable works. In the aftermath of the Haiti earthquake, Facebook and Twitter pages were set up by groups to collect donations from social network users. Short message services (SMS) or text messaging was also instrumental in allowing cell phone users to send millions of dollars to charity groups in what is now called “mobile giving”. “It’s fast, safe and convenient. A single donation can take no more than 15 seconds to do,” said Reade Barber, director for data, Rogers Communications, Toronto. Using SMS and social media channels to donate or inform about social causes is growing in adoption,” according to Jim Manis, CEO of the Seattle-based Mobile Giving Foundation.